This course covers the complete Design for Six Sigma (DFSS) body of knowledge, including both product and process design. Select a version below to customize your course description. The Product version includes additional lessons on advanced statistics and experimental design. Both versions use the D-C-D-O-V roadmap. Design for Six Sigma (DFSS) is not a methodology in and of itself. Rather, DFSS is a set of best practices and tools which, when integrated into a product / service development process, increases your organization's ability to meet your customers' requirements in a timely, cost-effective manner. The overall objective of this course to introduce you to the best practices and methodologies that are essential for developing product or process designs that meet customer requirements at the highest possible level of quality. Select optimal product or process design concepts. Employ your DFSS skills to lead a successful development project delivering meaningful results to the organization. To successfully complete this course, you must review all of the lessons and complete all of the quiz modules. 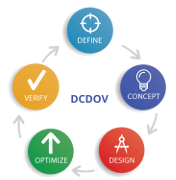 The course is presented in a logical sequence to follow the Define-Concept-Design-Optimize-Verify (DCDOV) representation of DFSS. At the core of the course are the principles of understanding customer requirements, translation of requirements (QFD), design concept generation and evaluation, and development of predictive transfer functions. 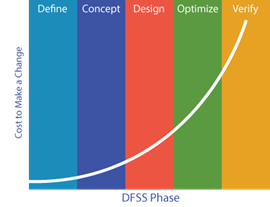 The DFSS course also covers design optimization, robust design, and incorporates some Lean concepts (e.g., continuous flow, identifying waste, value stream maps) for Design for Lean Six Sigma (DfLSS). Process Playground™, MoreSteam's online discrete simulation tool, is now available for free in the Optimize session of both versions of the DFSS course. Want to know more about how MoreSteam's courses are designed? Then take a look at our eLearning Overview. It is important to understand that the DFSS course itself does not represent a generic development process. The course is laid out as a process to facilitate orientation to your organization's own development process. After going through the course and understanding the purpose and application of the various tools, methods and best practices, you should compare the content of the course to the tools, methods and best practices in your organization's development process. This process of comparison will highlight gaps between your organization's process and its potential as a DFSS development process. You will then be able to close the gap by integrating the missing material into your organization's process. Are you an engineer, programmer or process designer? Do you need to create new products or services? Then this course is right for you. In either version, you not only discover and learn the core concepts of DFSS, but you gain experience and competence as you apply them to the course project simulation. Online training is ideal if you have limitations on your time, travel, and budget, especially if you've been asked to work your day-to-day job at the same time you need to learn DFSS. Our courses provide you with content-on-demand, which means you can set your own schedule, progress at your own speed, and review and re-enter sessions whenever you wish. It's flexible, practice-based, and accessible whenever and wherever you need it. Flexible: This course is presented in a logical, DCDOV format, but the sessions are modular, so you can explore the material as, how, and when you like. Alternate design roadmaps are also available to corporate clients. "An excellent vehicle for learning and applying the principles of Design for Six Sigma, process and product." "This was a really fun way to learn. The materials will be a great reference. The tools are wonderful." "MoreSteam has done an outstanding job of making the "DFSS for Process" training a meaningful experience. They clearly understand how to deliver quality training because they recognize that requires BOTH excellent material AND knowledge of the delivery medium." "I found this course to be very up-to-date in its thinking, and it has a very high relevance of reference material." • What is Design for Six Sigma? This course (both versions) assumes that you have previously mastered at least the Six Sigma Green Belt body of knowledge, specifically Measurement System Analysis and Multiple Regression Analysis. Service Version: If you have not mastered this body of knowledge, we recommend that you first enroll in the Lean Six Sigma Green Belt course, which will provide appropriate preparation. Product Version: You will also need to understand basic Design of Experiments (DOE) for this version. If you have not mastered this body of knowledge, we recommend that you first enroll in the Lean Six Sigma Black Belt course, which will provide appropriate preparation. Process Playground™, MoreSteam's online discrete simulation tool, is now available for free in the Optimize session of both versions of the DFSS course. One year license to MoreSteam's web-based data analysis software, EngineRoom®. Microsoft® Excel® templates for statistical analysis, available as downloads within the course material. Minitab® is required for the Product version of the DFSS course and is not included with the course. Microsoft Office (Word, Excel, Powerpoint). Office 2007 or higher is recommended. Older versions of Excel do not support all MoreSteam template features. Does this course include certification? We do not offer a formal certification for our short courses. As proof of your training, you receive a formal certificate of completion when you pass all of the course quizzes. You also receive CEUs or PDUs of credit. Of course! Many of our larger customers send tens to hundreds of employees through DFSS training. Please contact us directly to discuss your specific needs.